I surely hope that I don't need to introduce this band to the readers of Background Magazine. 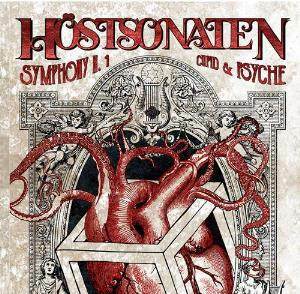 Höstsonaten has been among my favourite Italian bands for many, many years with their typically Italian brand of symphonic prog in which they fuse classical and folk elements. Now the band has taken things a step further to the next level. For some time mastermind Fabio Zuffanti had been dreaming of composing a symphonic suite for group and orchestra on a mythological subject that could also serve as ballet music, thereby following in the footsteps of classical composers like Stravinsky and Tchaikovsky. Cupid & Psyche is the first of a series of projects in strictly classical style that Fabio and keyboard player Luca Scherani would like to work on in the future. For Cupid & Psyche the rock band Höstsonaten (well, OK, rock band is actually not the best description for Höstsonaten, but you know what I mean) teamed up with the Formus String Quartet, musicians on woodwinds (oboe, bassoon and flute) and a brass section. The combination of classical instruments and rock group has been done many times before in the past decades but rarely as successfully as this. Often rock band and classical instruments stand beside each other, but in this case the music is composed and arranged in such a way that they are fully integrated and interlocked. Since this is a symphony in its truest sense, it's no use to single out separate songs. The piece and the album have to be listened to as a whole. But still, I'd like to point you to some sections that appealed in particular to me, like the wonderful soaring electric guitars in Love Scene, the interplay between woodwinds and acoustic guitars in the second half of Unmasking or the building up of tension in Venus (some massive Mellotron and effective use of brass and strings). There is even some flirtation with jazz-rock through the quirky Sheep And Water with delicious electric piano that fabulously interacts with saxes and strings over loose percussion and some nice accents from the oboe. This may very well be my favourite bit. Although the (classical) finale of Ascension is also very, very worth your while. As usual with Höstsonaten the artwork is great and very fitting to the style. The album comes as a papersleeve gatefold CD, gatefold LP (in purple vinyl even) and as a limited edition CD box (sold out, I'm afraid). Highly recommended for fans of symphonic prog with a mind for classical music.